The Fury of Firestorm: The Nuclear Men #7 seems to be a hit with the fans! I’ve seen loads of positive comments praising the new direction! Today I thought I’d feature some of that fan feedback, plus some Fury of Firestorm news! My window is open, my desk fan is providing a nice summery breeze, and I’m cranking the best of David Bowie. Drawing Ronnie Raymond’s new costume. This is the life. I’m thinking about drawing another issue of FIRESTORM. I really had fun with 7 and 8. I could do 11 or 12…? Joe Harris is writing these awesome scripts. I always want to draw them. A new costume for Ronnie?!?! More issues drawn by Ethan?!?! How cool is that!?!?! Nothing is official from DC Comics yet, but I’d say Ethan is a fairly credible source. Fury of Firestorm #7: gets really dark and creepy. And I dig it. #Firestorm 7 by Evs (co-plotter, cover, and art) & Joe Harris. Wow! Was my first reaction! EVS’s art rocked! Harris’s script was dead on! I removed last names as some people are sensitive about Facebook and privacy. So, Fury of Firestorm with Joe Harris. Pardon my French, but aww f*cking yeah! Pitch perfect. This book lacks nothing. NOTHING! read firestorm #7 by Joe Harris and Ethan Van Sciver and am loving the direction this book is going. if you are not reading this title, i would highly suggest you do so. if you tried it earlier and it was not to you liking…give the new team a shot and try it again. hell, i will give my friends the $3 they spend on the book if they don’t like it! if you are in tampa, make sure to visit Heroes’ Haven for your copy. Fury of Firestorm the Nuclear Men #7 = Best issue of this so far! The writing tone FINALLY matches the great concept that this book is. Joe Harris is the man! THANK YOU! As a lifelong Firestorm fan, I’m now pleased. Ethan’s art is pretty damn great in this as well! Awesome job on Firestorm #7 EVS! Really loved it! Firestorm #7 was an awesome read!!!! Ethan when are ya gonna start drawing a book on a regular basis?! yes great issue!!! can’t wait for the next chapter love the new darker tone of the book! and another interior issue?? ?YES PLEASE i don’t think i have ever seen your pencils look so good ! Have been a Firestorm fan since I was a kid and this is the best take on the character ever …..you rule EVS!!!! Such great feedback from a bunch of great match-heads! Now to be completely fair and honest, I have also seen a few lukewarm comments about issue #7. However, those moderate reviews seem to be the minority. Overall I think Ethan Van Sciver, Joe Harris, Hi-Fi Colour Design, and DC Comics should be really happy with the fans reaction! Support Firestorm! Keep fanning the flame! 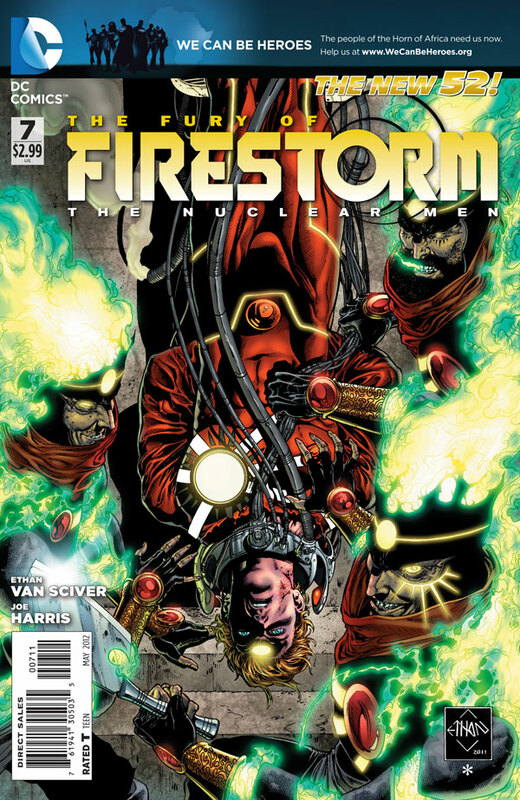 Posted in: Comic books, Ethan Van Sciver, Firestorm #09: New 52 v1 (Firestorm Protocols), Firestorm comic vol. IV, Joe Harris. What makes Van Sciver even more cool, other than the fact he is on the Firestorm book, is that he listens to Bowie. What exactly is the new direction here? It’s more Zither, more Pozhar, more rogue Firestorms to be worried about. It was a good book, don’t get me wrong, but I was expecting more difference to live up to the hype. I really like issue # 7, and have Tweeted as such, but I have a similar question as Martin Stein above has. I have generally enjoyed all of the issues up to now, so my thought process might be a little different than his. For those that have a more discerning eye than I, and who may like Issue # 7 more, what separates this issue from the previous 6?